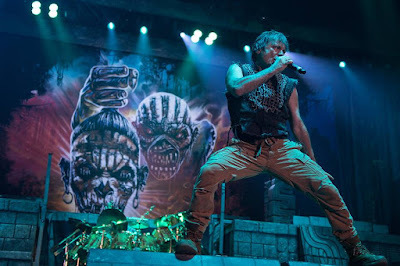 Iron Maiden launched their 2017 tour in support of 2015’s “The Book Of Souls” in Antwerp, Belgium on April 22, and fan-filmed video from the event has surfaced online. The band’s 15-song set at the city’s Sportpaleis opened with “If Eternity Should Fail” and included the live debut of “The Great Unknown”; both tracks are featured on the 2015 double album. The show delivered several Maiden classics and tracks from nine of the group’s records, and saw the first performance of 1981’s “Wrathchild” since 2014. The Antwerp show will be followed by five concerts in Germany over the next week before Iron Maiden play their first major UK arena tour in six years; the 13-date run will wrap up at the end of May, after which the band will begin a North American tour in Bristow, VA on June 3. In sync with the 2017 trek, Iron Maiden will complete their vinyl reissues series with twelve albums from the group’s catalogue scheduled for re-release on heavyweight 180g black vinyl this spring. Following the 2014 launch of reissues of the group’s first eight records, the band are following up with a dozen projects that will be released over a three-month period. The 2017 editions wrap up on July 21 with “Death On The Road” (Live), “Flight 666” (Live), “The Final Frontier” and “En Vivo!” (Live).